Your reasons for owning a personal hot tub at home are your own. With a new Bullfrog Spa you may be able to alleviate stress, relax, entertain your friends, improve your landscape, spend quality time with family, and to be healthier and happier. In fact, spa owner’s often express that they actually experience benefits they never expected when they get their new hot tub. Each person is unique, but you and everyone in your life will enjoy the hot water, soothing massage, and invigorating hydro-therapy in your own way. Nothing enhances the aesthetics and functional design of your backyard quite like a beautiful Bullfrog Spa. Your spa will become both a functional and beautiful centerpiece of your outdoor living space. You’re backyard is your own little piece of the world. You deserve to make it all it can be. Many hot tub owners claim that they no longer feel the need to travel to exotic locations to unwind. All it takes is a stroll in your backyard paradise and a soothing soak in the spa to feel rejuvenated and ready for whatever life brings. In just a few minutes every day you can reduce your stress, re-connect with those you love, and have fun with friends and loved ones, all part of a balanced approach to life. With life’s ever increasing velocity, it’s never been so important to create ways to maintain your personal wellness. Everyone needs some time to relax and meditate and a hot tub is a natural addition to your backyard sanctuary. It will become the perfect place to find the balance you require. The calmness of proper wellness habits will come over you and improve all aspects of your life. It all starts with the right state of mind and nothing helps you achieve that better than quiet time in your Bullfrog Spa. The most important thing in the world is your family. Yet everything these days seems to be pulling the family apart. Life, activities, friends, work, and even technology seems to make finding quality family time nearly impossible. Well, an enjoyable spa in your backyard is one thing that everyone in your family will love. Kids of all ages have fun in the hot tub and you’ll always know where your teenagers and their friends are hanging out. Parents enjoy the real conversations that occur when you’re all relaxing together. And with JetPaks everyone can enjoy their own favorite massage or water feature. Bring your family closer together in one place where everyone wants to be – the hot tub. You’ll never have to worry again about what to do when friends come over. 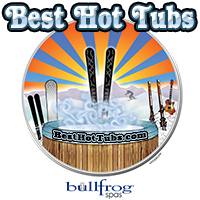 Your Bullfrog Spa is a perfect group activity for hot tub parties, get togethers and backyard barbeques. With a killer multi-color LightWave light show and the Spa and Yard stereo system, complete with Bose speakers, you’ll become famous for throwing the best parties around. Bullfrog’s large hot tubs can seat up to 8 people and the powerful JetPak System makes it so everyone can enjoy their massage at the same time. You’re fame will travel fast and soon everyone will want the invite to the next hot tub party at your house. Stress is one of those things that just happens with life. Nobody is immune. However, too much stress can lead to serious health issues and a shortened or unhappy life. Luckily, the swirling warm waters and relaxing JetPak massages in a Bullfrog Spa are the perfect therapy for overcoming stress and tension. Give yourself just a few minutes to sit back and relax in your Bullfrog Spa and you’ll be amazed at how much more relaxed you feel. Your stress will dissappear and you’ll be ready to tackle whatever situations life can muster. Whether it’s a backyard get together with a few friends or quality romantic time with someone special, your Bullfrog Spa is sure to enhance your social life. There’s just something about sharing quality time in the soothing waters of your own personal spa. Everyone is relaxed, the conversations are easy and pleasant, and nobody wants to leave. Leading a healthy social life has many other benefits. In fact, studies show that a healthy social life improves your physical and mental health and leads to more balance and a greater sense of well being. With impressive LED lighting and the Elite Audio System, you’ll become famous for throwing the best parties around. Bullfrog’s large hot tubs can seat up to 8 people and the powerful JetPak System makes it so everyone can enjoy their massage at the same time. You’re fame will travel fast and soon everyone will want the invite to the next hot tub party at your house. Doctors and other health professionals have devised many types of physical and medical therapies that help to overcome aches, illness, and other ailments. However, perhaps no therapy type has such a rich history of success as hydrotherapy. Going back as far as written history people have utilized the soothing and healing qualities of warm water to improve their quality of life. In ancient times it was natural hot springs that provided hydrotherapeutic benefits. Today hydrotherapy has joined with science in the form the the personal spa or hot tub. With the healing powers of warm water combined with a bio-engineered JetPak massage selected specifically for your therapy needs, no spa provides better, more personalized, hydrotherapy than a Bullfrog Spa.